Oh no no no, I'm a rocket man… with a shotgun. Meet Good Twin, Evil Twin the pyromaniac, Maurice the sniper and El Bruto the luchador - likely the most inefficient squad of video game robbers since the Bonanza Bros. Unlike Sega’s duo, however, these boys come with built-in jetpacks which does facilitate some nifty vertical movement. Why they would choose to wield low range shotguns as weapons of choice is a bit of a tactical mystery. 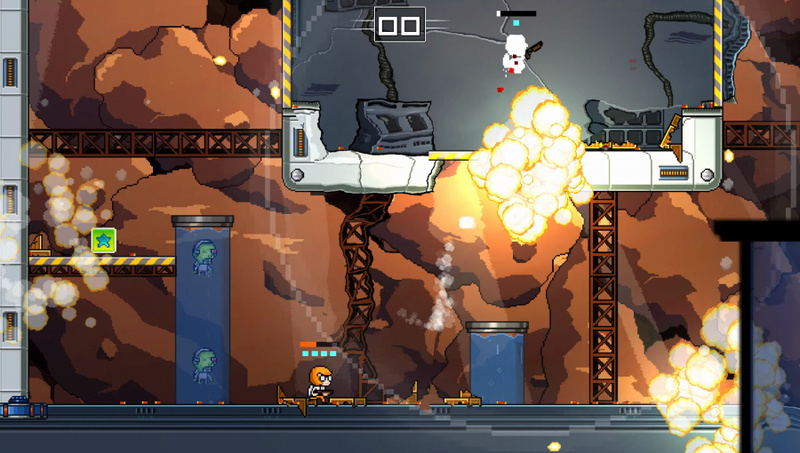 This strange combination will provide you the core gameplay elements of this amusing title. Maurice will give you the 101 of rocket-shotgun combat tactics with a nifty tutorial that will introduce you to the controls and tactics of the game; ‘Y’ is used to unleash lead from your shotgun (or melee if your enemy is right up in your face), ‘B’ is used for all sort of jetpack movement trickery, ‘A’ is used to block (and timely blocks will award you special energy chunks to use in special moves) and ‘X’ enables you to use extra weapons (mostly of the explosive variety you happen to pick up mid-fight). This turns out to be a fairly balanced mix of Super Smash Bros. meets Towerfall Ascension but with enough of its own original twist to make it stand on its own merits. It's not mandatory, but we recommend you start to play the game in Story mode once you clear the tutorial. 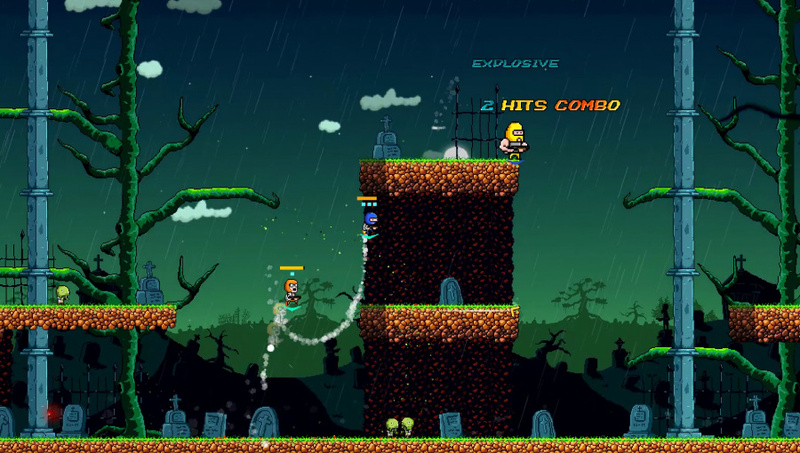 This seven chapter zany adventure (which you can play along with a friend) will not only enable you to experience all eight different characters with their own unique stats and special moves, but it will also act as a training for the multiplayer mode. Completing it will unlock every stage, character and extra weapons to be used in the other modes. It will take you no more than half an hour, but great humour ensures you will be smile every minute. 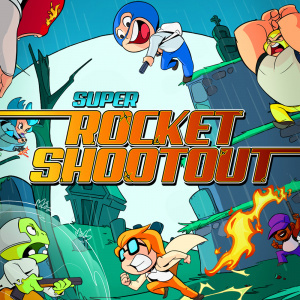 Arcade mode gives you the standard ‘pick a character, fight everyone else at a time’ to the end, but grab a friend (or three) and ‘Shootout’ is where Super Rocket Shootout truly shines. With two players this mode is fun, but with the glorious complement of four human players each struggling to line up the perfect shotgun blast to the face -while at the same time boosting all over the screen - is the true experience here and where the game truly shows its party game potential. Graphics are purposely crude and thankfully the art style suits the nature of the game rather well, ensuring that even in the most chaotic of times - when most of the screen is nothing but a beautiful chain of explosions - you can always clearly tell where your character is. The arenas are cleverly designed and each one always offers some sort unique stage hazard; our favourite is the moving train on which you can die by falling onto the track, be splattered when the train enters a tunnel or simply blow up the car roofs for better movement. One might even say the stages are as charismatic as the zany character roster itself. 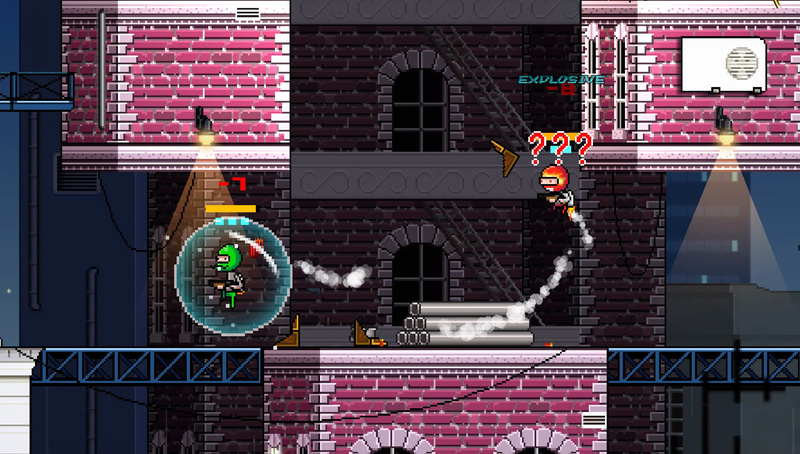 Music is adequately high-paced and often dropping into chiptune territory which nicely complements the game’s graphic style. Super Rocket Shootout is a bit short on single-player content, but what it offers for the lone rocket-strapping, shotgun-wielding player is a welcome addition to what is, at its core, an excellent party game package. As such, if you happen to have one to three friends available feel free to bump that final review score by one. The over-the-top insane action and laughs you will get with your friends more than justifies it. Local multiplaying is so Nintendo. Hope they always gonna keep this feature, so unique and so perfect. Other compagnies dont act that way. This game looks fun. You sold me with the sub header line. Good song. The story mode was a nice surprise. Very zany, likeable cast. This is the kind of game I would never get good use out of.